← Pebbles in Your Peas? Strychnine in Your Stout? 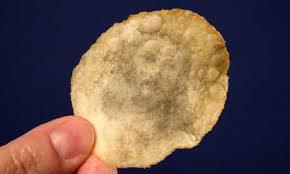 Music – “Jesus In A Tortilla” from Jesus In A Tortilla by the Bucky Burro Band. Released: 2005. Has anyone ever wondered why it is that when there are Jesus sightings, they tend to occur more in foods than in any other category? 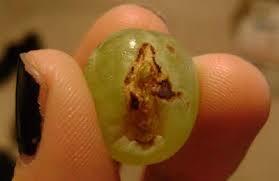 Now, over the years, there have been multiple reports of spotting Jesus in rocks, wood, trees, store-front windows, office buildings (along with his mother that time), sheet metal, rotting wood, shower curtains, lava lamps, chest x-rays, ultrasounds, light bulbs, farmer’s fields, even the rear end of a dog (let’s just skip that one, OK?) However, he appears to show up in more food items than anywhere else and I wondered why this was. 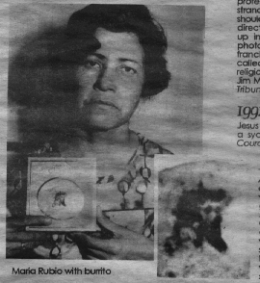 In 1977 he was spotted in the now-famous tortilla made by our own New Mexican, Maria Rubio, who was making fresh tortillas for her husband’s breakfast, when she was startled to see the face of Jesus in one of the tortillas. 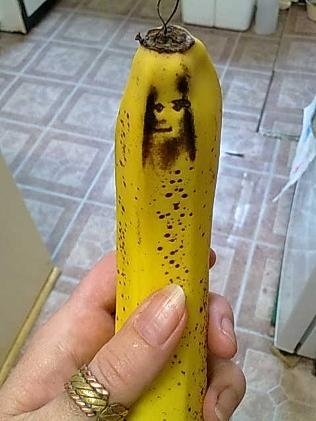 While researching this topic and trying to figure out why Jesus keeps popping up in our kitchens, I learned that he has been spotted in banana skins, potato chips, fish sticks, pizzas, cheese, latte’s, naan bread, grapes, toast, pierogis, and Cheetos, among other food items. 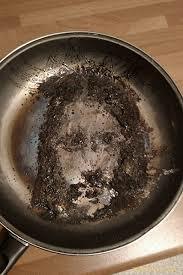 Perhaps not content to show up in food alone, he’s also been spotted in the bottom of a frying pan! There have been numerous sightings of him in tortillas, in addition to the 1977 New Mexico case. Tortillas are a staple in New Mexican tradition, and are often served with breakfast, along with a nice plate of Huevos Rancheros. Perhaps there is no coincidence that Jesus keeps showing up in the morning, as researchers have long reminded us that breakfast is the most important meal of the day. Maybe the reason he appears in food so often to us is because of his legendary culinary skills. 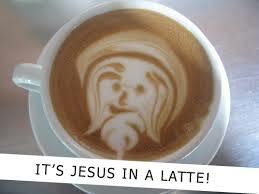 After all, he was able to make wine out of water and feed 5,000 people with five loaves of bread and two fish. Now that’s talent! 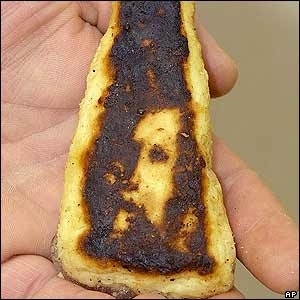 So, why is it that it’s usually religious icons such as Jesus, or The Virgin Mary, who turn up in our pierogis or Kit Kat chocolate bars? Growing up, I used to have a huge crush on Richard Chamberlain (“Dr. Kildare”), yearned to meet him, and watched Dr. Kildare religiously (pardon the pun), but I never caught a glimpse of him in my bologna sandwich or on my morning toast (we didn’t do tortillas at our house in Toronto – perhaps that’s the reason why I never spotted him). 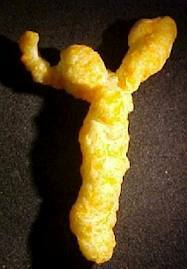 I never saw Elvis in a potato chip or a Cheeto, but I didn’t much care for Elvis, so I wasn’t really scanning my food seriously to see if he might be lurking there. I guess the sightings might be likened to the Rorschach Test, you know, where the Psychiatrist shows you a bunch of inkblots on paper and you’re supposed to tell him or her what you see. Below is one such inkblot (sueb.hub pages.com). Give it a try. Your impression is your own. But, if you see Dr. Kildare, can you let me know? Even though I eat tortillas regularly now, while living in New Mexico, I still haven’t spotted him and I’ve been looking for a long time! Common impressions of the inkblot test include a bat, a butterfly, a moth, an elephant, or an angel. All I see is a couple of dancing rabbits! This entry was posted in Comfort Food, Cookbooks, Cooking, Cooking and Social History, Eating, Uncategorized and tagged Bucky Burro Band, Cooking, Images in Food, Images in Tortillas, Jesus, Maria Rubio, New Mexico, Religious Icons, social history, Southwest, Sue Jimenez, The Virgin Mary. Bookmark the permalink.